On Friday last week, I was running around like a chicken with its head cut off. 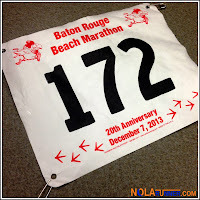 Coincidentally, the reason for the scurrying was prep for my participation in the 20th Anniversary of the Baton Rouge Beach Marathon put on by the Running Chicken Track Club. 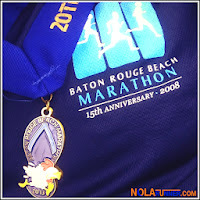 Another significant note about this race is that I ran the Baton Rouge Beach Marathon as my first full in 2008, returning for the full in 2009, and the half in 2012. That would make this year’s edition my 5th Anniversary of finishing a full marathon. As a result, I determined in the weeks prior to the race that come hell or high water, I would celebrate by making this my 31st full marathon finish. The first obstacle in my path came in the form of a holiday party that my friends decided to throw the Friday night before the race. Not only did that keep me in New Orleans and unable to venture to Baton Rouge in advance of race day, but I had to resist the temptation of great food, good wine, and a late night of revelry. Being the disciplined runner that I am, I only had two glasses of red wine, mini sliders and a pastry assortment from Costco. Clearly, my definition of “disciplined carb loading” is flexible. In spite of my race-eve indulgences, I woke up before my alarm on Saturday at 3:45am and lay in bed until “Marimba” started playing. I easily got up, donned my race attire, grabbed my pre-packed necessities, and headed out the door with a feed bag in hand. The drive to Baton Rouge leaves something to be desired, but the lack of traffic at 5am was a nice change from the gridlock I’m used to. Arriving shortly before 6am, I parked at the designated off-site location and boarded a yellow school bus to be shuttled less than a mile to the start line. The first PA announcement I heard as I disembarked the bus was that the temperatures would feel like 28 degrees at the start with a chance of rain and a slight possibility of snow. An audible groan could be heard rippling through my fellow participants. 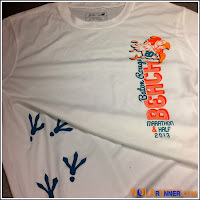 I wasted no time picking up my race bib, really awesome race shirt, and participant bag that included a cool pair of Running Chicken socks, race koozie, supplement samples, and race info. The most important item in the bag was a pair of simple white knit gloves. I immediately put them on, and then stuffed each with a disposable hand warmer that I had brought from home. As I slowly regained feeling in the tips of my fingers, I ran in to fellow runners Nicole and Ken who were soon followed by Jenn, Stephen, and Erica. We talked about the day’s goals and pacing plans; however, I was the odd man out running the full. They all had the good sense to run the half marathon, but I reinforced my determination to go big or go home. Before we knew it, the time had come for us to line up together behind the starting line arch and wait for the starting gun to fire. Stephen, Ken, Nicole and I ran the first several miles in close proximity. I talked to Ken and Stephen off and on, recounting stories from training and other races. Eventually Ken peeled off to run at his own pace, but Stephen stuck with me. He was great for distracting conversation while keeping me on a 9:30 - 10:00 pace. We maintained this for the majority of the first 11 miles, which shows that we weren’t overly exerting ourselves since we could talk and run. Not burning out was an important goal since I was going to be doing another lap of the course. One conversation that did come up multiple times was that if it started to rain, I was done. I can run in heat, cold, wind or snow, but icy rain is where I draw the line. Stephen took off and ran the last couple miles of his half in front of me. I utilized both my ear buds and settled in to a zone for the second half of my race. 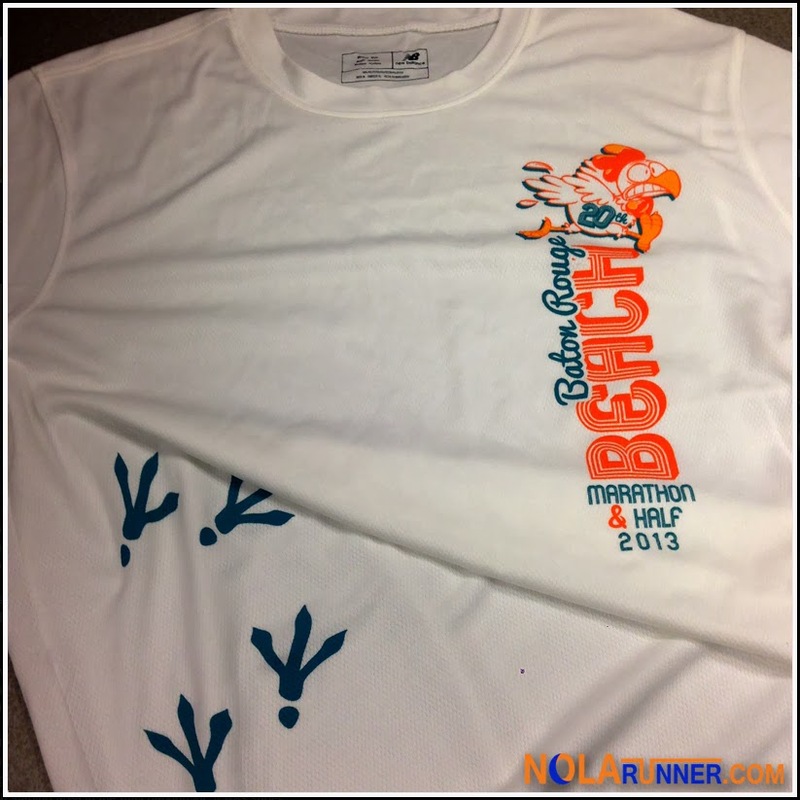 The most taxing part of this course for full runners is that halfway through the race, they pass the finish line and see runners coming to a stop as they conclude their race. Seeing the finish line five yards away from the course and not being able to cross it takes a toll mentally, but I pushed through. The second loop for the full is the exact same course as the first half, except it’s much more desolate. 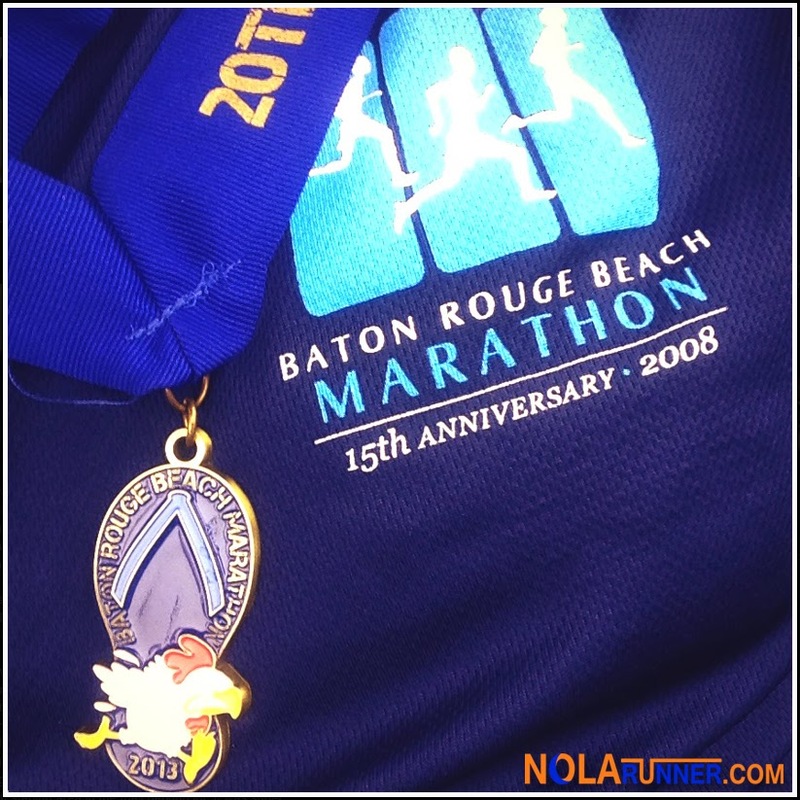 Running through Baton Rouge neighborhoods, LSU’s campus, and around scenic lakes had me cross paths with significantly less runners and even less spectators. The temperatures didn’t rise as the day progressed, and the rain held out. It was great conditions to run a marathon, especially since I still had on my trusty gloves that didn’t come off for the entirety of the race. The course marshals still did a great job stopping traffic to wave runners through intersections. I maintained a pretty consistent, albeit slower pace, for the second loop. I decided to establish a pattern of running a half mile, followed by a minute walking. This allowed me to keep an 11:00 – 12:00 pace, and cross the finish line in just over four and a half hours. I wasn’t excited about my time, but I was thrilled that I had finished the race feeling great. 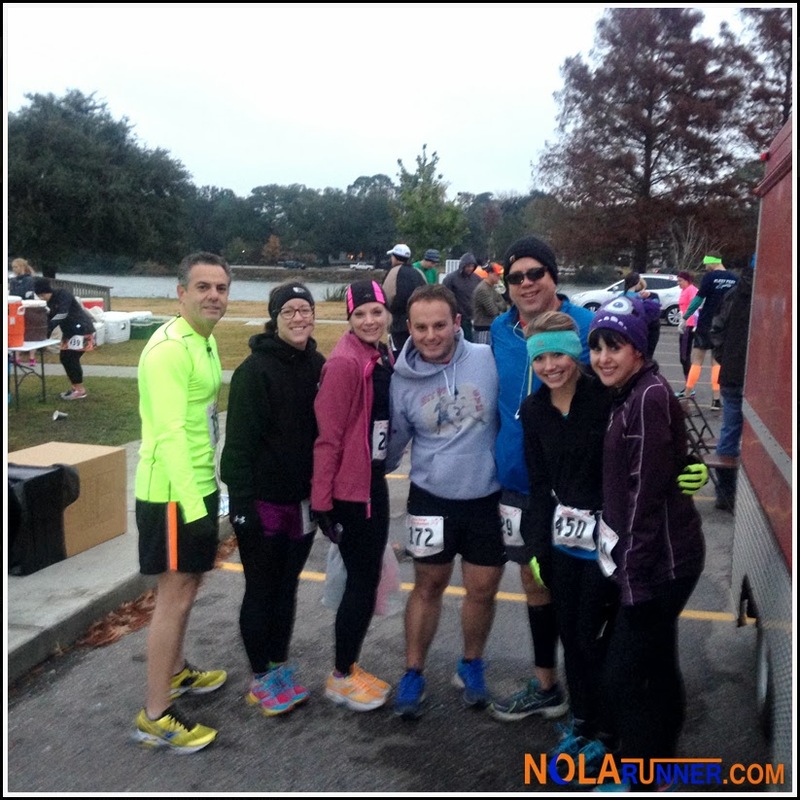 I was in a good mental place at the finish line, could easily move about to claim my belongings from bag check, and enjoy the jambalaya and alligator sauce piquant provided for participants. I was disappointed that I didn’t have a charge on my phone to be able to photograph the finish line after the full. There were no lines for the plentiful food, and the scene overlooking the LSU Lakes was picturesque. After shuttle bussing to my car and getting enough of a charge to make the obligatory “I’m alive” call to my mother, I drove back to New Orleans ready to re-consume the 3,800 calories I had burned. I’ve run this race numerous times, so clearly they are doing something right to keep me coming back. As the race grows, so does the opportunity for organizers to enhance the event and the experience for its participants. My main concerns this year were three-fold. First, on-course marking was very hard to maneuver for the second half of the full. The mile markers were well placed with the very bright and awesomely designed new race logo; however, turns in less trafficked neighborhoods were only marked by fading spray paint on the street. I know I saw several runners miss turns, but I was helpless to direct them as they couldn’t hear me or were too far away to catch and alert. I’m guessing there are participants out there who have GPS watch readings that came up significantly short on distance. Next, the water stations on the full course weren’t all manned for my second visit. I can think of three stations specifically where the water coolers and cups were left out for runners to rehydrate, but there wasn’t anyone staffing the area should a runner need assistance. I’m sure the bitterly cold weather played a factor, as I don’t remember this being an issue in the past. I’ll also say that the tables that were manned by volunteers were awesome. The station featuring a volunteer in a gorilla costume, the squad of caballeros, and the LSU sports team (I think rowing) manning miles 10 and 23 were all well placed and a good source of encouragement at important junctions on my journey. Finally, I was thrilled that the event offered a bag check this year. Especially since I parked off-site and took a bus to the race, I was happy to have a bag waiting for me with a sweatshirt at the finish line. However, no one was watching the checked bags when I went to pick mine up. All of them were lying around the parking lot unsupervised. My wallet, car keys and cell phone were in my bag since I needed an ID pre-race to pick up my number and a way to get in touch with running friends. I would have been lost had the bag disappeared. A simple secure tent would have made me breathe a little easier when picking up my items. Running the full at the Baton Rouge Beach Marathon in 2013 was much like reuniting with an old friend. We’ve stayed in touch, keeping up with one another from a distance, knowing where our growth has taken us. We even meet up when the stars align, spending quality time together usually in four hour increments. I know that I’ve grown both as a person and as a runner because of my affiliation with this race. Having a positive experience with marathons from the onset set the tone for these past five years. I truly believe that in December of 2008, I made a decision that will positively affect the rest of my life. For official race results, click HERE. For more photos from the race, LIKE the NOLArunner Facebook page HERE. Thanks, Nicole! Everyone out there in that weather is inspiring, and slightly crazy. It was a great morning for a great race. Glad I got to see you there! I know your hot button topics, Anne. Just think what you could eat with a 4,000 calorie deficit! There are people who run because they like to run. There are people who run because they like to eat. I'm a combination of both! Enjoyed reading your report. I ran the full for the first time in this race, the half this past two years. On the second loop, I missed a turn and found myself running alone. I seemed to have heard runners yelling behind me but they were too far and too faint to set me straight. By the time I got back on track, I had run 0.35 miles longer than necessary. My Garmin shows 26.55 miles afterwards, dead on. Despite that, I BQed anyway, for the first time, quite happy about that. Like you, I would have quit if rain, thank God! Everything you described in your report are dead on. My only suggestion is giving out a thermal blanket to finished runners would be nice in a day like this. This is a great race for runners looking to BQ. Will be back next year. Congrats on that BQ, Robert! Awesome job. Does that extra 0.35 mean you qualified while running an Ultra?! You have me pumped for my first full. Congrats on #31 and many more to come. Great seeing you Saturday morning, Ken. Nice job on this half. Can't wait to run with you on your first full in January! Great recap, and congratulations on #31! I was looking forward to those finish medal/finish time texts on race morning. You really powered through this one and you should be proud of all that you accomplished in this race and the other 30. Just awesome. Of course you were the first text after my "I'm alive" phone call, Katherine! Thanks for all of your support and encouragement. Couldn't have gotten this far without you.